Offering roll off dumpsters for rent to homeowners and construction contractors. With a large variety of sizes there is no job that is too big or too small. Our roll off containers all have a large gate at the back for easy access into the dumpster. The bins also have an open top to maximize the garbage dumpster service. Getting rid of your junk and debris is hassle enough, don’t make renting a dumpster difficult too. 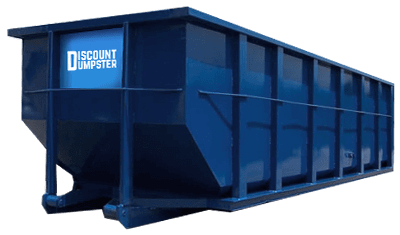 Discount Dumpster has the experience to understand the best size for your job so you are able to save time and money. If you are the DIY type a residential dumpster will work well for all of your projects. Become a weekend warrior by redoing the bathroom you may be putting off and then take on the kitchen. With experienced drivers we are able to place large and small dumpsters in tight areas at your home. Complete your project and get rid of the garbage quicker with a large roll off container. By utilizing a residential dumpster for rent you will have the ability to tackle the toughest tax and look like a pro doing it. Just like every job, having the right tools in your toolbox makes the project run smoother. Contractors depend on Discount Dumpster for their waste management needs. We understand that deadlines are important which is why we offer fast and reliable service to contractors nationwide. Keep your jobsite moving by hauling all the junk away in one place. We offer dumpsters for rent in a variety of sizes so that every job you may run into is tackled with a roll off container. Find a dumpster near your next jobsite today. We offer different sizes so that every job you have can be taken care of. You load it with debris, old junk, and trash and we haul it directly to the dump. We understand that projects have a budget. That is why we strive to offer the most affordable, reliable, and project friendly dumpster service available.